Supertuff manufacture a variety of heavy duty plastic tanks and stainless steel mobile frames to provide a range of chassis trucks suitable for industrial use. Designed to handle heavy loads of goods these stainless steel and powder coated chassis trucks are perfect for industrial storage and materials handling applications. The robust plastic container is manufactured using rotational moulding, providing a seamless and incredibly durable plastic tank. The steel mobile frames are constructed from either stainless steel and equipped with castors with polypropylene wheels; or powder coated steel and equipped with rubber wheeled castors for varying terrain. Incredibly strong and durable the rotational moulded plastic tanks are manufactured from food grade polyethylene. Ideal for handling food produce and food ingredients these food grade plastic containers are used throughout the food manufacturing and food processing industries. 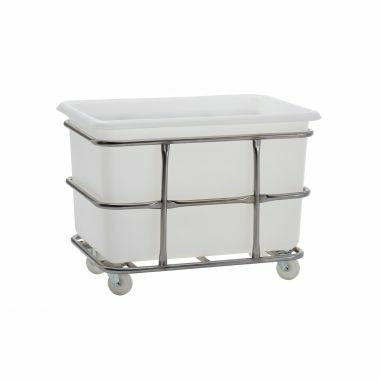 Seamless and watertight the robust plastic tank can be effortlessly cleaned and prove to be very hygienic. 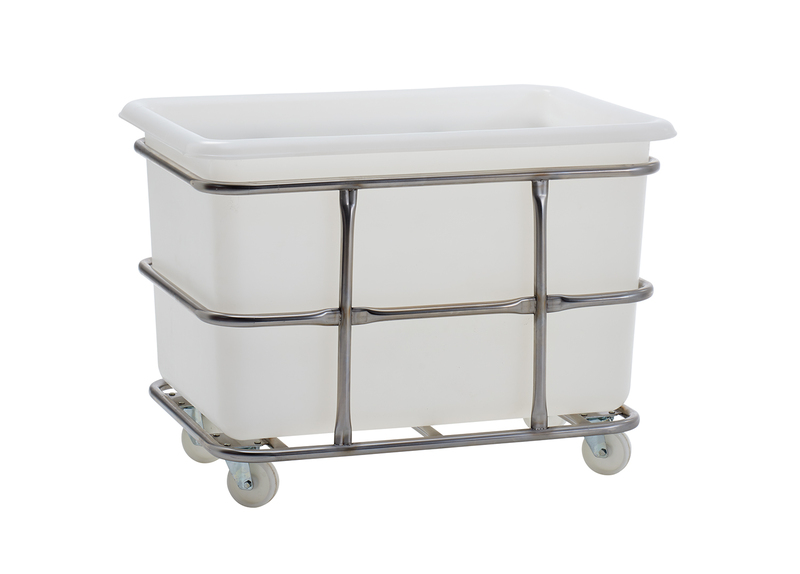 Used in food handling environments the hygienic properties of these plastic tanks and steel chassis trolleys makes them ideal for use within the pharmaceutical and healthcare industries also. Available in a variety of different sizes, the heavy duty plastic containers can be produced in over 12 different food approved colours to assist with colour coding. 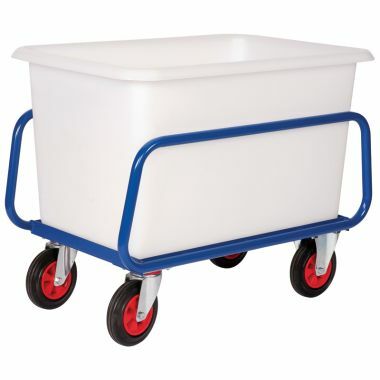 The plastic container trucks or chassis trolleys as they are also known, are ideal for handling heavy loads of food ingredients, food products or goods. Easily manoeuvred the chassis trucks and plastic tanks are both extremely tough and durable making them perfect for industrial use within warehousing and retail distribution, waste and recycling environments. The heavy duty plastic tanks are available separately if spares are required and an optional plastic drop-on lid can also be supplied. 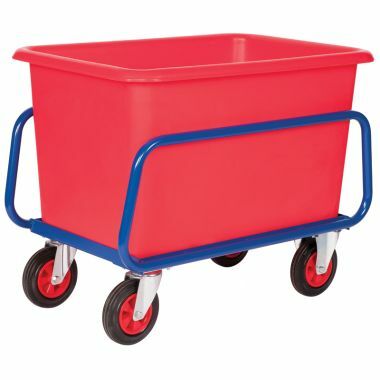 Offering large capacities these mobile plastic container trolleys are often used for storing bulk amounts of goods as well as being used as make-shift decarbonising units and cleaning baths for tools and utensils. 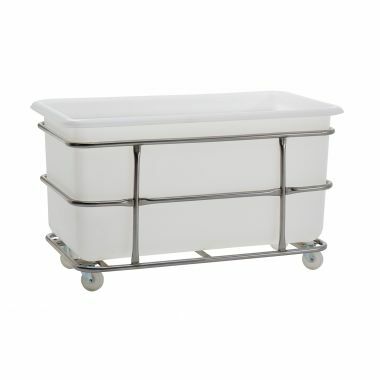 Seamless and watertight, the polyethylene plastic tanks are ideal for handling liquids and can also be fitted with drainage plugs, drainage taps and drainage holes with rubber bungs if required. Supertuff offer a labelling service for all of our plastic containers, plastic tanks and plastic crates, creating bespoke adhesive labels to help with identification of products. For further details on labelling please contact our sales team today.